All the human senses become engaged in ritualizing sacred texts. These essays focus especially on ritualizing the iconic dimension of texts through the senses of sight, touch, kiss, and taste, both directly and in the imagination. Ritualized display of books engages the sense of sight very differently than does reading. Touching gets associated with reading scriptures, but touching also enables using the scripture as an amulet. Eating and consuming texts is a ubiquitous analogy for internalizing the contents of texts by reading and memorization. The idea of textual consumption reflects a widespread tendency to equate humans and written texts by their interiority and exteriority: books and people both have material bodies, yet both seem to contain immaterial ideas. Books thus physically incarnate cultural and religious values, doctrines, beliefs, and ideas. These essays bring theories of comparative scriptures and affect theory to bear on the topic as well as rich ethnographic descriptions of scriptural practices with Jewish, Sikh, Muslim, Christian, Buddhist and modern art and historical accounts of changing practices with sacred texts in ancient and medieval China and Korea, and in ancient Middle Eastern and Mediterranean cultures. All the human senses become engaged in ritualizing sacred texts. These essays focus especially on ritualizing the iconic dimension of texts through the senses of sight, touch, kiss, and taste, both directly and in the imagination. Ritualized display of books engages the sense of sight very differently than does reading. Touching gets associated with reading scriptures, but touching also enables using the scripture as an amulet. Eating and consuming texts is a ubiquitous analogy for internalizing the contents of texts by reading and memorization. The idea of textual consumption reflects a widespread tendency to equate humans and written texts by their interiority and exteriority: books and people both have material bodies, yet both seem to contain immaterial ideas. Books thus physically incarnate cultural and religious values, doctrines, beliefs, and ideas. 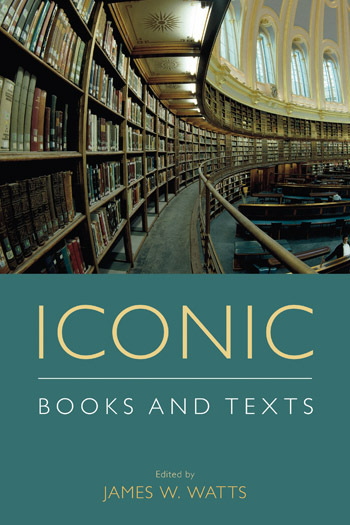 These essays bring theories of comparative scriptures and affect theory to bear on the topic as well as rich ethnographic descriptions of scriptural practices with Jewish, Sikh, Muslim, Christian, Buddhist and modern art and historical accounts of changing practices with sacred texts in ancient and medieval China and Korea, and in ancient Middle Eastern and Mediterranean cultures. 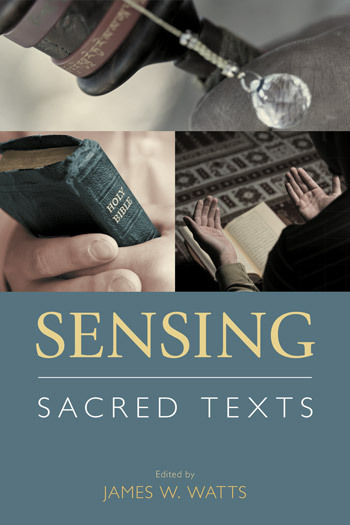 The essays in this special issue of Postscripts were commissioned for a symposium on the theme, “Seeing, Touching, Holding, and Tasting Sacred Texts,” that took place in the Käte Hamburger Kolleg on Dynamics in the History of Religions at the Center for Religious Studies (CERES) at Ruhr University in Bochum on April 7–8, 2016. During the 2015-16 academic year, the Kolleg focused its research on the theme “Religion and the Senses,” to which this workshop contributed. Brent Plate describes and categorizes the sensorium evoked by book arts and its implications for understanding the impact of books in general and sacred texts in particular. He argues that the aesthetic dimension of iconic books needs separate analysis to understand their impact. Dorina Miller Parmenter applies affect theory to the iconic dimension of bibles. Though not excluding the role of affect in performative and even semantic ritualization, she argues that affect theory provides an entrée into the distinctive role of the material book in the formation of people’s religious identity. Marianne Schleicher provides a detailed analysis of the ritualized processes of creating and installing a Torah scroll in a Jewish congregation. By grounding the artefactual uses of the scroll in each of the five senses, her essay demonstrates the pre-cognitive ways in which sensation shapes religious experiences of the text. Christian Frevel shows that the books of the Pentateuch in the Hebrew Bible already emphasize the visual representation, materiality and sensual experience of script. This biblical model for writings’ role in the construction and representation of ritual reality has resonated through religious cultures ever since. David Ganz examines the artefactual as well as documentary evidence for the ritual handling of late medieval gospel books and other liturgical books. He demonstrates how construction of the volumes intended to engage haptic perception and how the art in and on the books models the importance and significance of touching them. Katharina Wilkens deploys an analogy with linguistic code-switching to analyze the frequent clashes between semantic-purist and somatic-iconic ideologies over Quranic medicine in Muslim cultures, especially in East Africa. Her argument provides a model for understanding conflicts between scholars and practitioners over book rituals in a wide variety of religious traditions. Cathy Cantwell is Associate Faculty Member in the Faculty of Oriental Studies at Oxford University. Cathy Cantwell surveys Tibetan ritual practices with books to show that ritualized interactions with sacred books express and reinforce Tibetan Buddhist identity and veneration of the Dharma. They also serve pragmatic medical ends. Her detailed discussion concludes by drawing comparisons and contrasts with the use of iconic books in other cultures, including the observation that Tibetan texts become more sacred through their ritual use. Yohan Yoo examines the instructions of two influential Neo-Confucian sages on the discipline of reading Confucian texts. They recommended imaginatively tasting the text while visualizing its author and hearing the author’s voice reciting the contents rather than the reader’s own. Yoo emphasizes that this discipline went beyond metaphor to employ the senses imaginatively in ritual reading. The collection concludes by drawing on C. S. Pierce’s theory of signs and Roy Rappaport’s theory of ritual to argue that touching sacred texts and the sight to people touching them indexes their religious identity. Through ritual touching, these books become material manifestations of deity and transcendence which, in many traditions, become the most important religious artefacts.